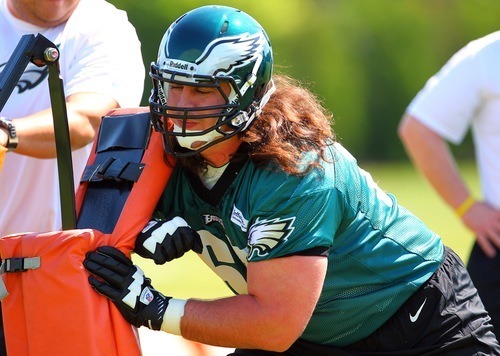 Because someone has to read all the news coming out of the Eagles training camp. Punters, ahoy. The Eagles brought in not one, not two, not three, but four veteran punters for tryouts yesterday. It’s not that surprising once you understand how bad Chas Henry was last year. Reuben Frank says the most likely candidate to sign is former Pro Bowl Cowboy Mat McBriar. I honestly didn’t realize he had fallen off last year and was cut. Turns out, he couldn’t lift his foot. Backup Running Backs Will Push… Who? I absolutely don’t understand where this headline comes from. Sheil’s replacement isn’t looking so hot. Jimmy Kempski tells us that Mudd also alluded to the Vandervelde-Reynolds backup center competition as the position battle he’s most looking forward too. I’m not sure if that’s positive or depressing. Final Mudd note: I discount every positive thing he says about Demetress Bell by half. There’s only one Jason Peters, and unfortunately he couldn’t keep his balance on a Roll-A-Bout. In other meta-reportage, Jimmy needs to stop wasting his time talking to guys like Keenan Clayton after practice. Clayton’s competing with Moise Fokou for the coveted “last linebacker cut” trophy. Then again, at least our favorite NFC bEast blogger didn’t get stiffed like ol’ timer Paul Domowitch. Rampant Tight End Speculation! The Eagles have now been linked to Visanthe Shiancoe and (gag) Jeremy Shockey. Raise your hand if you’re shocked that the Brett Brackett hype was purely media-driven. No one? Good. Andy Reid Weight Loss Watch. He totally walked home from practice, guys. Tagged with Philadelphia Eagles, NFL, Training Camp, DeSean Jackson, David Culley, Contract, Chas Henry, Mat McBriar, Dion Lewis, Running Back, LeSean McCoy, Sheil Kapadia, Howard Mudd, Danny Watkins, Demetress Bell, Keenan Clayton, Paul Domowitch, Tight End, Visanthe Shiancoe, Jeremy Shockey, Brett Brackett, Andy Reid. July 24, 2012 by Brian Solomon.